One of the Quietest and Most Versatile Air Compressors Out There! While I will review some heavy-duty compressors, I realize some of you visiting my website need a model that will help finish a project after all the major renovations have been done. The one I’m about to talk about is also great for hobbyists and craftsmen. 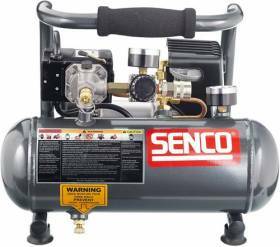 The air compressor in question is the Senco PC1010 1-Gallon 1-Horsepower Peak, 0.5hp running Compressor. Check out my review below. This compressor is best suited for some of the less heavy-duty tasks such as inflating tires or balls, painting, cleaning, nailing and so on. It is also a powerful tool that will help you with your hobby work. This is first and foremost an indoor compressor which is mirrored in the fact that it is one of the quietest I have come across. But don’t think it lacks any power because of it. With a peak of 1 horsepower and up to 125 PSI, it packs enough power for most home tasks. If you look at its performance rating numbers and quick recovery time you will see it is very efficient too. Air compressors come in many different designs, and this one features a popular “Hotdog” design solution which makes it pretty easy to move around and store. There are several types of air compressors based on the type of lubrication they use. Those that use oil-based lubrication are the most common however, this one doesn’t require any oil in order to work which I think is great since changing oil can get pretty messy. Truth be told, air compressors are not exactly known for being quiet, but the PC1010 is somewhat of an exception. The Hotdog design is much quieter when compared to its competitors which are built around a pancake design. The compressor also has rubber feet which reduces some of the vibration, and keeps your floor scratch-free at the same time. This particular air compressor can deliver anywhere between 20 and 44 drives per minute. It all depends on the type of air tool attached to it. It employs a 0.5hp direct drive pump with a peak of 1hp, and a snappy recovery time which means you can use the compressor for extended periods of time. 125 PSI is good enough for any kind of job that involves air inflation. Oh, and the capacity of the tank is 1 gallon. I’ve already mentioned its compact hotdog design. I also have to mention the tank is made out of aluminum which not only makes it durable, but it keeps the weight down as well. Tipping the scale at just 24lbs this compressor is lightweight, and extremely portable. Don’t let its miniature stature fool you because this unit is a true workhorse. An aluminum tank means it will remain corrosion-free, and withstand the occasional knock or two. Robust and well-built, it will keep on working for a long time, and you won’t have to worry about it rusting or breaking down. Once the amperage steps over the limit, the protective breaker on the pump kicks in to protect the motor. In order to reset the breaker and get the compressor ready for operation, you simply push the plastic stem and that’s it. I like this features because it’s not that common. Amperage is not the only issue when it comes to overload. If the compressed air exceeds biased levels, you need some sort of mechanism that will allow you to relieve the pressure. Fortunately, this unit has a safety relief valve that does just that. There is also a pressure/motor switch which is there to ensure the compressor motor starts when the pressure inside the tank is lower than the preset cut-in pressure. If the switch is left in the ON position, it will cut the power to the motor when the tank pressure reaches the cut-out pressure. Another feature that is not often present on other models is the air intake filter which is there to provide dry, clean air to the pump. The filter is completely removable and washable. Also, in case the moisture builds up inside the compressor, you can take advantage of the drain valve. There is much to like about this compressor. It’s light, portable, has a quick recovery time, is durable, and has a number of safety features which prevent anything unplanned from happening. It is also one of the quietest compressors I have come across so far. If you like what I’ve just presented, you can find this air compressor here on Amazon at a discount price.